William Gray Purcell and George Grant Elmslie were the namesakes of the architecture firm Purcell & Elmslie. It was the second most commissioned firm of the Prairie School style of design after Frank Lloyd Wright. Three partnerships evolved over years to result in the architectural practice most commonly known as Purcell & Elmslie. Purcell and his Cornell School of Architecture classmate, George Feick, Jr. created the Purcell & Feick partnership in Minneapolis, Minnesota, in 1907. George Elmslie, friends with Purcell since 1903, was an informal influence in the work of Purcell & Feick. In 1909, he formally joined the office and in 1910 the name of the firm changed to Purcell, Feick, & Elmslie. Feick left the partnership in 1912, and the name of the practice became Purcell & Elmslie until its dissolution in 1921. The architects were commissioned for work in 22 states. The firm had offices in Chicago, Philadelphia, and Minneapolis. Prairie School architect George Grant Elmslie (February 20, 1869 – April 23, 1952) was an American, though born in Aberdeenshire, Scotland. He worked with Louis Sullivan, Frank Lloyd Wright, and later with William Gray Purcell. Following the dissolution of his partnership with Purcell, Elmslie worked occasionally with various other architects, including Hermann V. von Holst and William Eugene Drummond. He also produced a number of banks, train stations, commercial, and institutional buildings during the 1920s and 1930s. Most of his work is mostly found in the Midwestern United States. 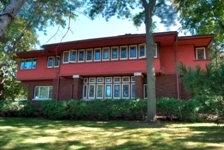 Prairie School architect William Gray Purcell (July 2, 1880 – 1965) was born in Wilmette, Illinois. After his partnership with Elmslie ended, Purcell continued with his own practice in Portland, Oregon, before tuberculosis forced him into bedrest between 1931 and 1935. Following a successful lung surgery, Purcell retired to an estate near Pasadena in the foothills of southern California. He continued to develop and support the cause of American architecture for another 30 years, mainly through publishing many essays, consulting with architectural historians, and other writing. He also authored the 1967 book, St. Croix Trail Country: Recollections of Wisconsin, a memoir of his youth spent in the Wisconsin lake country. Both Purcell and Elmslie eventually received Fellowships in the College of the American Institute of Architects. Elmslie was elected in 1947 and Purcell in 1963.